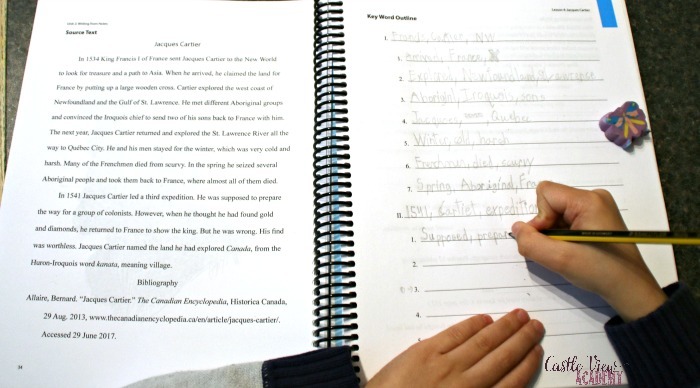 Home » Culture » North America » Canadian History, Writing, And Public Speaking: All In One! 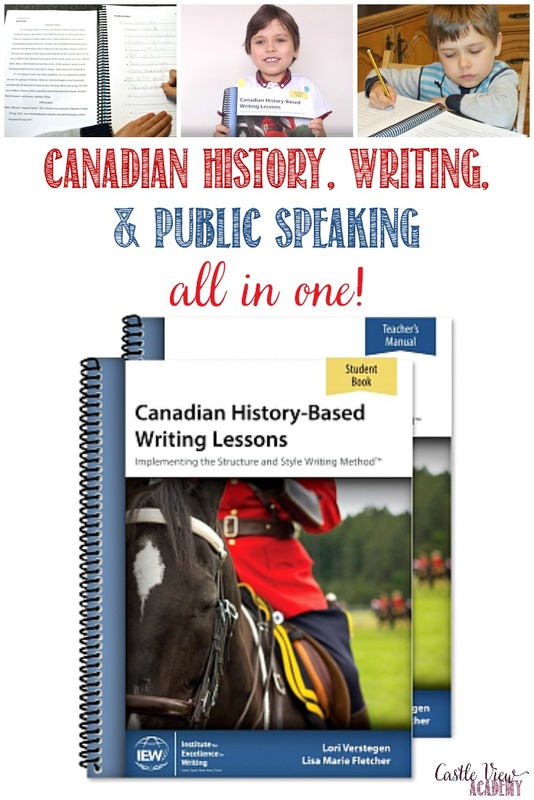 Canadian History, Writing, And Public Speaking: All In One! 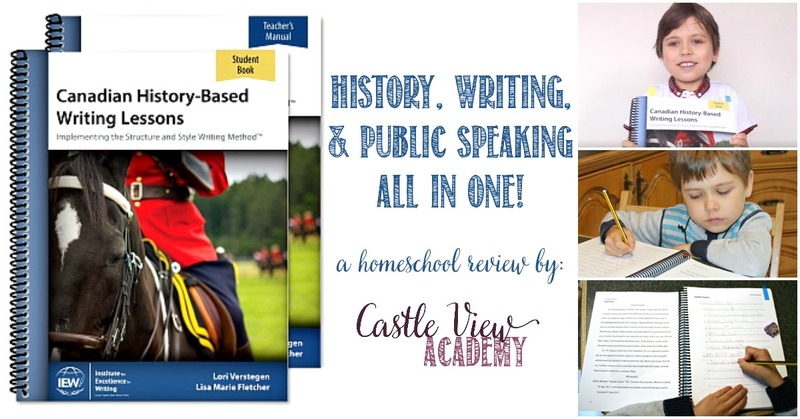 I’ve heard so many wonderful things about Institute For Excellence In Writing (IEW) over the past few years, and finally we’ve had the opportunity to try it out for ourselves with their new curriculum, Canadian History-Based Writing Lessons. As a Canadian ex-pat it’s important to me that my children learn about their Canadian heritage, and this course combines history, writing, and also thrown is a little public speaking practice. And wow! It’s truly amazing! IEW kindly sent us both the Student’s Workbook, as well as the Teacher’s Manual, which are spiral bound and makes them easy to use and handy for keeping everything in one place. This curriculum is aimed at students in grades 6-8, but there’s scope for flexibility as Tristan is currently in grade 4 and he’s really enjoying it. I was a little worried about using this course as I haven’t had any experience with IEW previously and it’s assumed that teachers have attended an IEW Teaching Writing: Structure and Style seminar and own the Seminar Workbook. 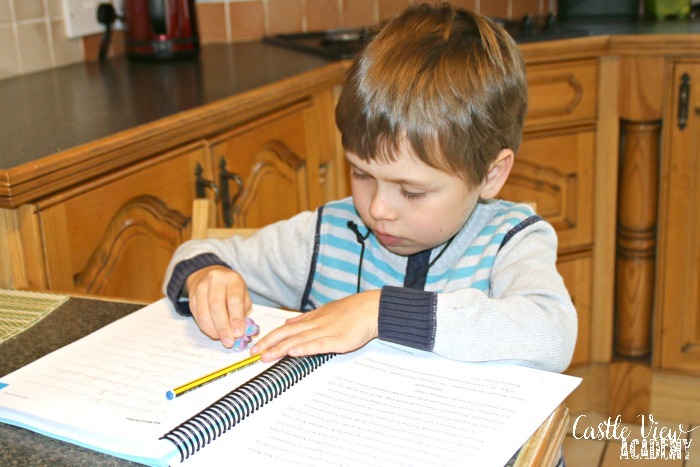 So I am pleased that although this is certainly a benefit to classroom teachers, for us homeschooling parents it’s possible to use this curriculum without having prior IEW training or experience. The Teacher’s Book cannot be used in place of the Student Book, but it does show reduced-size graphics of what is in the Student book, the answers (of course), and some tips on teaching the lessons. There are also vocabulary flashcards on blue card stock at the end of the book that are easy to cut out. 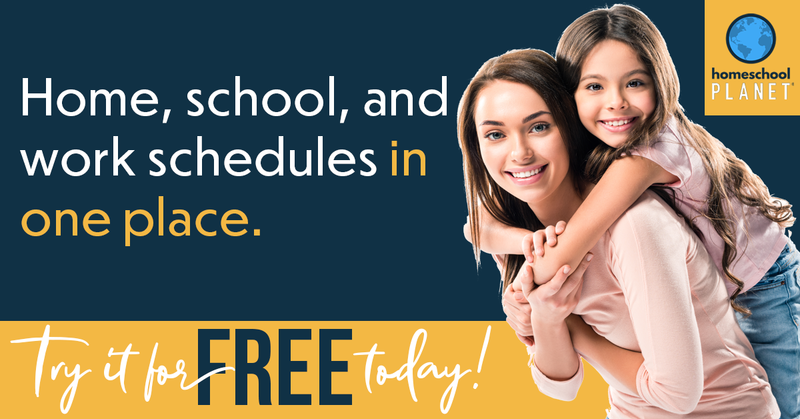 The suggested weekly schedule runs on a four-day week, which is perfect because we’re trying to get back to a four-day week, ourselves. However, I am finding that there is a lot more work on the first day of the week, but it’s easy enough to move a little to day two so that Tristan doesn’t lose focus. Read the short text for the lesson. Each text is only about 1-5 paragraphs each, so not too intensive. The student will travel through Canadian history from the First Nations, the landing of the Vikings and then the Europeans, through to the World Wars and the underground Railroad, Confederation and on up to how Canada became a nation with her own identitiy and rights, and then moves on to prominent Canadians and characters in books, such as Anne of Green Gables. Then make an outline using 2-3 keywords for each sentence, using the worksheet. During this process students will also learn a little shorthand that will help them as they transition to higher level classes and will need it for note taking in lectures (I didn’t know about shorthand until I was in University and developed my own form). How useful this is for the real world! It’s time now to practice telling the story out loud from your outline! Tristan loves this part, and it’s great practice for public speaking, too. You can see above how comfortable he is, unlike his mother! Then it’s time for some brainstorming during which the student will learn ‘Dress-Ups – functions of grammar, such as who-which clauses, -ly adverbs, and the new vocabulary, etc. There is some practice using these, and they will think of ways to incorporate these styles into the next part of the lesson. Now it’s time to use the keyword outline and write down the story in your own words, and ensuring that the elements used in brainstorming are included. Finally, it’s time to sit down at the computer and type out your edited version of the story; which must be done in MLA format. Don’t worry, though, each lesson comes with a checklist that clearly tells you what you need to have included for that final polished version, and the teacher also uses this to mark the final copy (the number of points for each element is also included there for you to make the grading transparent). As the student works through the book, each lesson builds on the one before and becomes a little more complex each week, thus building up confidence as the student works through the course. This arrived into our homeschool at the optimum time as the children were learning about Scandinavia, Vikings, and First Nations in other courses, and this brings all of those aspects together into a Canadian viewpoint, which differs from the United Kingdom and American perspectives that are more typically accessible for us here in Northern Ireland. It’s really amazing how this year so many various aspects have come together so perfectly and ignited the curiosity and attention of my children. I say children, because although Tristan is the one ‘doing’ this course, Kallista (7) is also learning from listening to Tristan read and practice the texts. It’s a two-for-one bonus! The first two weeks were a bit of a learning curve for Tristan and I, but once we knew the lay of the land and started to create our own history, Tristan got into the swing of things and happily worked away. Tristan has been using this course for the past month or two (he’s had a couple of breaks while Phil was off work), and I’ve noticed a real difference in his abilities, even over that short period of time. He’s thinking about stronger words to use in descriptions, and also pointing them out when I use a strong adverb! Originally, I had thought that we would try this out for our review and then set it aside for a year or two until Tristan’s in the target age group…but Tristan doesn’t want to do this – he’s very keen to continue on with this right now! And he’s doing so well at it, that I’m very happy for him to do so! I’m really very impressed with how this course brings everything together so nicely and combines so many aspects of language arts and history together, and additional research can also be done on the topics in which the student is interested in; both by using the historical novels suggested, as well as using other resources (I’ve found a few of the Canadian Heritage Moments useful for short visual information). I am glad to see such a wide range of historical topics covered and they’re divided up so that it doesn’t seem so overwhelming. By going over the information in both written and spoken form several times the facts are easy to remember and not soon forgotten. 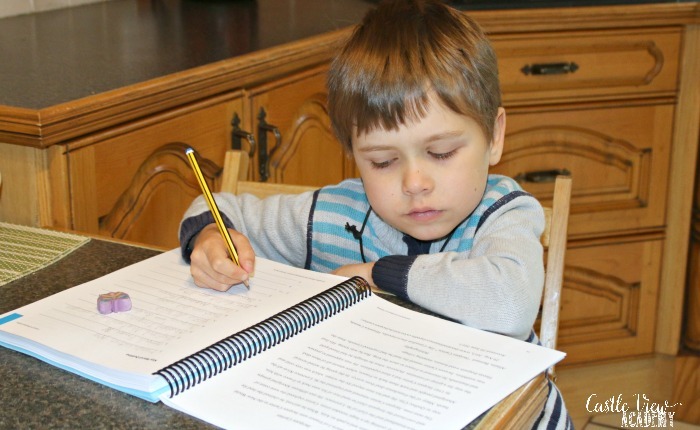 Overall, using the Canadian History-Based Writing Lessons has been a pleasurable learning experience for Tristan, and I love that he is enjoying it so much. If you have an interest in either history or learning to write and speak more fluently, then I would highly recommend this course. If you’d like to know more or would like to follow the Institute For Excellence In Writing, you can connect with them through their website, Facebook, Twitter, Pinterest, YouTube, and Google+.